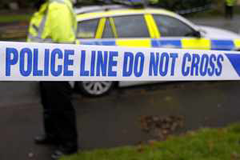 Man held as four stabbed at Mosque in Birmingham Police have arrested a 32-year-old man on suspicion of attempted murder after three men and a police officer were stabbed at a mosque in Birmingham. "> Police have arrested a 32-year-old man on suspicion of attempted murder after three men and a police officer were stabbed at a mosque in Birmingham. Police have arrested a 32-year-old man on suspicion of attempted murder after three men and a police officer were stabbed at a mosque in Birmingham. Officers were called to the mosque on Washwood Heath Road in Ward End at about 23:00 BST on Saturday. In a statement, West Midlands Police said three men were found to have suffered stab injuries. As police arrested the man, the officer was also wounded. All four injured are in a stable condition in hospital. Officers are conducting patrols in the area in a bid to reassure local people, a spokeswoman for West Midlands Police said.